This is part two of a three part series on Micah 6:8. "He has shown you O mortal what is good. 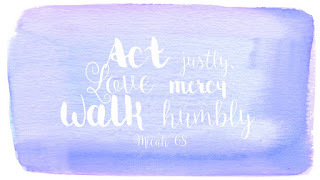 And what does the Lord require of you? 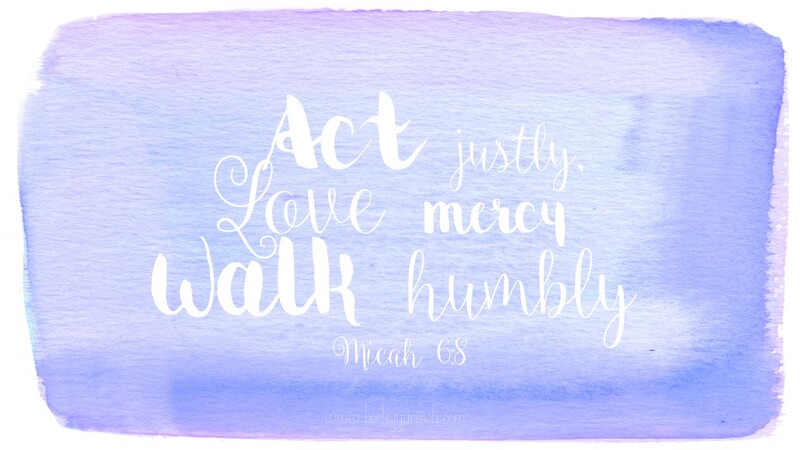 To act justly, and to love mercy, and to walk humbly before your God." I have a confession to make. This part, the love mercy part, is tough. That’s exactly what I think when I hear or read Micah 6:8. I love the idea of mercy. It is essential to my faith. God gives me new mercy every. single. day. Mercy can be defined as: the kind or forgiving treatment of someone who could be treated harshly. Now, I know what you’re thinking: “But Becky, you talk about being kind. And not being judgy. And not being a jerk.” And I do believe all of that, but can I tell you something just between us? My Mercy Bone is broken. I have big, big feelings about people in horrific circumstances. I hate to see anyone starving, or trafficked, or hurt in any way. Folks who have no control over their situation get ALLLLLL of my sympathy, empathy, and whatever else they need. I am willing to give it all up. BUT, people who are in an unfortunate position because of the choices they’ve made? Choices that aren’t good for anyone? I struggle. Especially when those decisions affect the people I love most. I have a family member who is currently serving prison time. Lots of years of it. I struggle with forgiveness because I see how their absence affects my family. Nobody should ever have to grow up without their parent, and no mom should have to visit her child in prison. So, while I hate that person isn’t living a normal life, I have difficulty feeling sorry for them and showing grace. Even when an abundance of grace has been poured over me. I pray for mercy to creep in and take away some of this anger, and slowly-but-surely, my heart is softening. And isn’t that what God asks of us? He asks us to soften our hearts to those who deserve harsh treatment. To be gentle to those who should face stiff consequences. I don’t know about you, but I know I’m in major need of God’s mercy. Can you imagine if He gave us the same amount of mercy we show others? It would be detrimental to our existence. Even if we could live without it, our lives would be nothing compared to living in the fullness of His grace. So, if you’re like me, with a broken Mercy Bone, how do we fix this? I think I have two answers. Yeah, just two. But if we do them consistently, maybe we’ll start to figure things out? One: pray for those who make you feel unmerciful. Maybe it’s a once-abusive parent or a sibling who consistently makes poor choices. Maybe it’s a coworker or a homeless person you feel needs to get a job. Whoever you look at and fail to see mercy, just pray. It’s hard to stay mad or unsympathetic toward someone you’re praying for. Ask God to help you see the person the way He sees them. His perspective is always much more gentle than ours. Two: Intentionally reach out to people you struggle to show mercy to. See, the most important thing I’m learning about trying to show mercy isn’t that my mercy changes others, it changes me. Showing mercy, especially when I don’t want to, allows Jesus to capture one more piece of my heart. It allows me to be more like Him. Isn’t that the goal after all?
. But how does withholding mercy from others make me more like Christ? It doesn’t. Jesus was more than merciful. He showed the ultimate act of mercy when He hung on the cross for my sins. If Jesus can do that for us, don’t you think we can show a fraction of that same mercy to His People? I promise to try. How has receiving the mercy of another person changed your life? I’d love to read your story in the comments section below!